Sunrise, FL – The Florida Panthers‘ quest for the postseason suffered a setback Sunday night, losing to the Tampa Bay Lightning 5-2 at the BB&T Center. The defeat to the NHL-leading Lightning snapped a brief two-game winning streak and wraps up a dismal four-game series sweep. Florida came into the game 11 points out from the final playoff spot while their in-state rivals rocked the best record in the league at 40-11-4. The first period was a defensive one with not a lot of shots on goal. 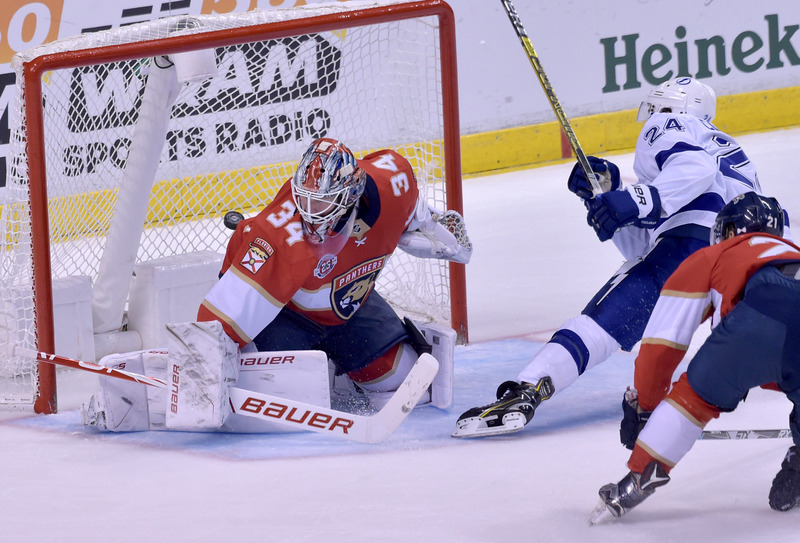 However, the Bolts struck first with league-leading Nikita Kucherov aiming one past goaltender James Reimer for his 23rd goal of the season, ending a 1-game goal drought. Both Victor Hedman and Anton Stralman contributed to the effort. For the last several games the Panthers enjoyed a rare dominance over their opponents in the opening period, outscoring them 13-3. But by the end of the first, the team found itself trailing 1-0. With seven minutes remaining a laser of a shot whizzed past Reimer. Luckily, it veered and clanged off the right crossbar. “Didn’t like our first period, we were way too casual, took us too long to get going,” Coach Bob Boughner. The team spent much of the night playing catch-up. Offensively, the Panthers struggled with converting on their scoring chances. In the latter half of the opening period, Florida center Aleksander Barkov missed a big opportunity as he was fed a nice pass right in front of goaltender Louis Domingue, only to be stonewalled. Late in the first, the Panthers picked up the pace hoping to tie the game. With less than two minutes to go, Keith Yandle slipped past two defenders but failed to seal the deal, as Domingue put a stick on it. Florida tried again with less than three seconds left as Derick Brassard shifted a pass across the middle straight into the stick of Yandle, launching it towards the net. Domingue flashed his glove, once again denying the home team. While Tampa Bay had the edge in the first, the second proved to be a see-saw battle. For every goal scored by the Bolts, the Cats responded. Tampa Bay captain Steven Stamkos redirected a pass off Stralman for his 29th goal of the season putting the in-state rivals up 2-0 midway through the game. Unwilling to let their postseason hopes slip through their paws, Florida finally got on the board. Jonathan Huberdeau faked a shot and flicked it Frank Vatrano, firing it through traffic and more importantly past the goalie to put the Panthers to within one with a twisted wrister. Late in the second, Florida’s power-play absolutely fell apart when Vincent Trocheck lost the puck to Ryan Callahan in a giveaway deep inside Tampa territory. Callahan raced across the ice, his opponents desperately trying to stop him. He lined up his shot mid-stumble, sliding one past Reimer for the incredible goal. It was now 3-1, Tampa. Despite the demoralizing play, the Panthers remained steadfast as Denis Malgin scored his sixth goal of the season to keep the team in the game. However, the Lightning pulled away for good with two powerplay goals in the third period. Florida was unable to keep up as they were stifled for the rest of the game despite outshooting their opponents (27-23), falling to 23-23-8. On the flip side, Tampa Bay improves to 41-11-4. After being asked on the coach’s decision to pull Reimer with Roberto Luongo, point-blank Boughner replied saying “Yeah, easy decision.” A very telling answer on the coach losing faith on his goalie for the evening. The Panthers continue their seven-game homestand with the Dallas Stars on Tuesday. Roberto Luongo passed Patrick Roy for second place on the NHL’s all-time list for games played by a goalie (1,030). He came into the game to start the third period, relieving James Reimer.